Editor's Note: A version of this article previously appeared at RickMulready.com. I have to admit, I'm not a Foursquare app user. I never saw the need to let people know where I was at all times. Just because I was going to get a coffee didn't mean I should be "checking-in" and letting the world know, "hey, Rick's at Peet's getting another Americano." And becoming the "mayor" of any one place didn't really do it for me either. At least, that's what I thought until I started seeing how big brands are using it. Some savvy ones are using it as a location-based marketing tool, not only to offer deals to someone when they check-in to their business, but also to add value to people when they're searching for different things in a city. Several weeks ago I was introduced to a company called the Corcoran Group. Turns out they're New York City's largest real estate company specializing in high-end property. They kept coming up with guests on my podcast as a brand that was doing really cool things in social media and content marketing. So when I had their director of interactive and product marketing on the show, he took me behind-the-scenes of their marketing. Corcoran uses Foursquare to add value to people in New York -- whether you live there or are just visiting -- by creating thousands of inside tips for different locations around the city. When you use the search feature on Foursquare, special tips from Corcoran's agents come up around wherever you're searching. For example, one of the most famous burger places in New York City is Shake Shack. They serve burgers and ice cream and are known for their uber long lines. A tip that Corcoran gives to people searching for Shake Shack is one that only locals would know: if you only want ice cream, you don't have to stand in the crazy long line. There's a separate line you can go to and bypass it all. That's a pretty sweet tip that would save you a ton of time, and a really smart use of Foursquare that adds value to people. Corcoran isn't selling properties with this strategy, but it's positioning itself as a go-to resource in the city. How can you do the same? If you're a personal trainer, for instance, you could give tips on local gyms or "must try" healthy dishes at local restaurants. If you own a restaurant that serves healthy food, you could highlight local farmer's markets. Where they are, when they are open and maybe any "must visit" stands. You could offer special discounts to people who "check-in." 2. Engage users with games and trivia. "Like" ESPN on Foursquare and it'll give you tips on the best arenas, stadiums, baseball parks, courses and soccer pitches around the world. It offer badges that signify you've made it to the "big leagues." On Foursquare, ESPN isn't selling anything. Rather, it's engaging and connecting with its target consumers by adding value through fun tips and trivia about sports. I live in Los Angeles and everywhere I turn I see van tours shuttling people around the city, pointing out where Sylvester Stallone lives or where some other celebrity likes to eat lunch. One of these tour companies could create fun tips for people who are searching for sightseeing spots around the city. This would help position it as the expert tour guide company in the city. For example, someone searching for Mann's Chinese Theatre on Hollywood Boulevard might get this tip: "Star Wars fan? Consider taking in Mann's Chinese Theatre in Hollywood around lunchtime every day. You're likely to catch Darth Vader walking around." People love getting an inside look at the lives of their favorite celebrities. 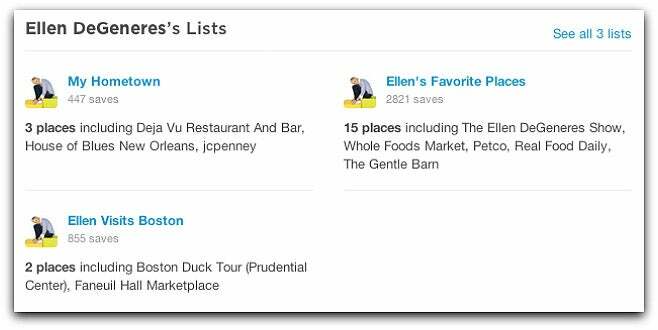 TV talk show host Ellen DeGeneres has built one of the larger followings on Foursquare and when you like her, you can see what her favorite places are around the world. If you go to these places and check-in you can earn badges and prizes, including the chance to go to her show. Say you own a local coffee shop. As you or your employees travel, you could create a list of all your favorite coffee shops from around the world. Offer check-in badges and prizes for people who check-in to those places. Give away free coffee or discounts to those people when they come to your shop. These three strategies are all examples of location-based marketing. It's a trend that's just getting started and only going to get bigger. The opportunity can be huge for small businesses because it gives us the chance to serve relevant content to a relevant audience at the most relevant time.